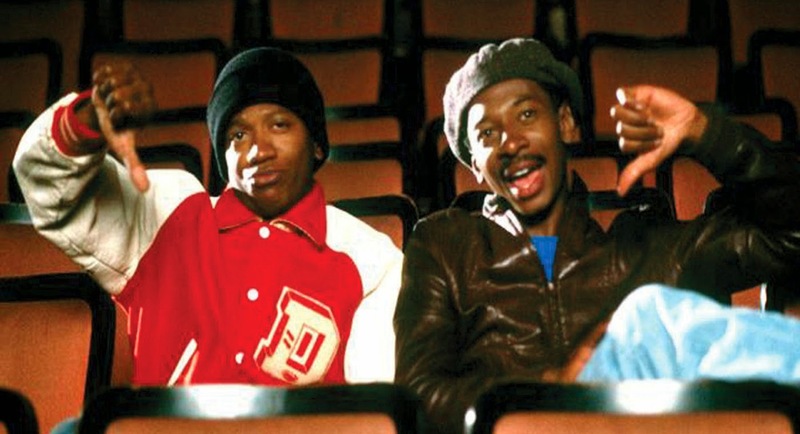 Robert Townsend's debut feature Hollywood Shuffle isn't just one of the most underrated comedies of the 1980s; it's also one of the most important. The 1980s were a tough time for a lot of up and coming black actors. With the passing of the 1970s, so too did the blaxploitation movement pass -- movies that featured all black casts and often told stories that filtered Hollywood genres through the African-American experience (though, to be fair, those blaxploitation films were not viewed as having the same legitimacy as they do today). Unless they were working on an A-list film -- often still predominantly white -- black actors were relegated to playing hoods and hookers. It was this tendency that inspired two young actor comedians, Robert Townsend and Keenen Ivory Wayans, to write 1987's Hollywood Shuffle, which confronts the problem head on and does it in a funny, poignant, slightly angry way. It's terrific. Townsend plays Bobby Taylor, a young fast food worker who dreams of becoming an actor. As the film opens, he's going on an audition for the character of "Jimmy" in a trashy, racist movie requiring him to shuck and jive and play yet another damaging stereotype. Though his co-workers (including co-writer Wayans) tell him to forget his dreams and his grandmother (Helen Martin) tells him such roles are beneath him, Bobby just wants to act. Most of the remaining film is played out via sketches and dream sequences in which Bobby imagines himself in other movies and genres, waiting to hear back as to whether or not he got a part he's not even sure he wants to play. The story goes that while he had been acting for years and played a few supporting roles in movies during the '80s (including appearing as one of The Sorels in my beloved Streets of Fire), Townsend was not getting the kinds of roles he wanted and decided to do something about it. He reportedly financed $60,000 of Hollywood Shuffle's $100,000 budget on his own credit cards, gathered his own repertory company (including Anne-Marie Johnson, John Witherspoon and Wayans) and made one of the most successful independent comedies of the decade. It's a comedy that's very funny and with a very specific point of view about Hollywood and the culture of the period. It's a hugely successful independent movie from a black filmmaker made during a time when there weren't enough of those (which is precisely the argument that Hollywood Shuffle). If it's not mentioned in the same sentences as Sweet Sweetback's Baadasssss Song and She's Gotta Have It, it needs to be. Hollywood Shuffle also predicts what Keenen Ivory Wayans would be doing just a few years later on In Living Color, as many of the movie's standalone sequences could easily be transplanted onto the FOX sketch show. A film noir parody in which Wayans plays a jheri curled crime boss is a cross between "Head Detective" and Wayans' Rick James impression. One of Shuffle's standout bits, "Sneaking Into Movies," would basically be broken up into "Men on Film" and "The Homeboy Shopping Network," two of In Living Color's more popular recurring sketches. The movie is rough around the edges and crudely made as only a $100,000 movie can be, but Townsend doesn't let that stand in the way of his ambition. Even when he gets some of the genre parodies wrong (the film noir segment is in black and white, but it misses everything else about the look of those movies), it doesn't matter. The fact that he mounted this many at all -- and that each one has something to say both comedically and socially -- makes up for the lack of polish. In fact, that same lack of polish only makes Hollywood Shuffle more charming. It has a DIY, get-some-friends-together-and-make-a-movie feel to it but is never amateurish. Everyone is working at the edge of their abilities. Revisiting Hollywood Shuffle in 2015 reminded me that it's funnier than I remember and still feels relevant; while things may be "better" than they were in 1987, there's still a long way to go. 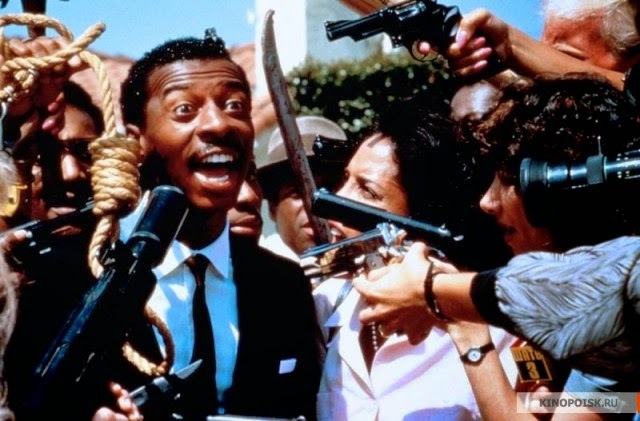 It also made me a little sad (and made my wife a lot sad, because she if forever taking on all of the sadness of the world) because Robert Townsend didn't become the household name it seemed like he would be when the movie came out in '87. This is a film that announces not just an important comic voice but a real filmmaker as well, and Townsend never made another impact quite like he did with his debut. At the same time, he has had a long and successful career, directing movies like The Five Heartbeats and Meteor Man and creating/starring on four seasons of the WB sitcom The Parent 'Hood. He built a body of work on his own terms, and that's exactly what Hollywood Shuffle is all about. After all, there's always work at the post office. Buy Hollywood Shuffle from Olive Films here. Yes, yes, yes!!! This is in my top ten favorite comedies of all time and I'm always surprised at how many people haven't seen it. "Batty, Batty, Batty!" Unfortunately Townsend has run into a bit of bad luck the past two years as he Directed Bill Cosby: 77 and Bill Cosby: Far from Finished. One of these was set to be released within a week of the Cosby story being broken and both were shelved for obvious reasons. I'm pulling for Townsend and hope he gets back on his feet. Oh wow I must check this out! 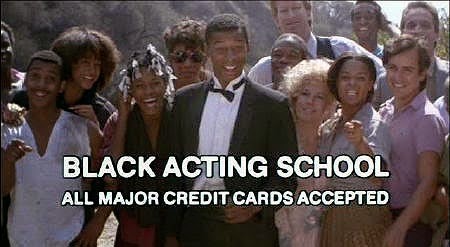 Black Acting School and Sneakin' Into The Movies are two of the funniest (and shocking) sketches within a movie ever. Btw- Patrick, Didn't you think that the actor playing Dirty Larry, Chicago Jones, Amadeus, etc... was Campbell Scott?! Way after I watched this and realized they were different people I couldn't believe it. Wonderfully zany late 80's pseudo-blaxploitation feature has remained ingrained in my mind ever since I saw it upon initial release (and sadly never since!) Townsend did indeed make quite a memourable splash with this picture and it truly does stand out as one of the less-lesser than most of the types of comedic films which were being churned out thoughtlessly (and scriptlessly!) in the late 80s.